I’ve recently discovered and fallen in love with Japanese soba noodles. Similar in appearance to thin spaghetti, they are made from buckwheat and come pre-bundled in individual serving sizes. Each serving has up to 14 grams of protein – an attribute that vegetarians will certainly appreciate. 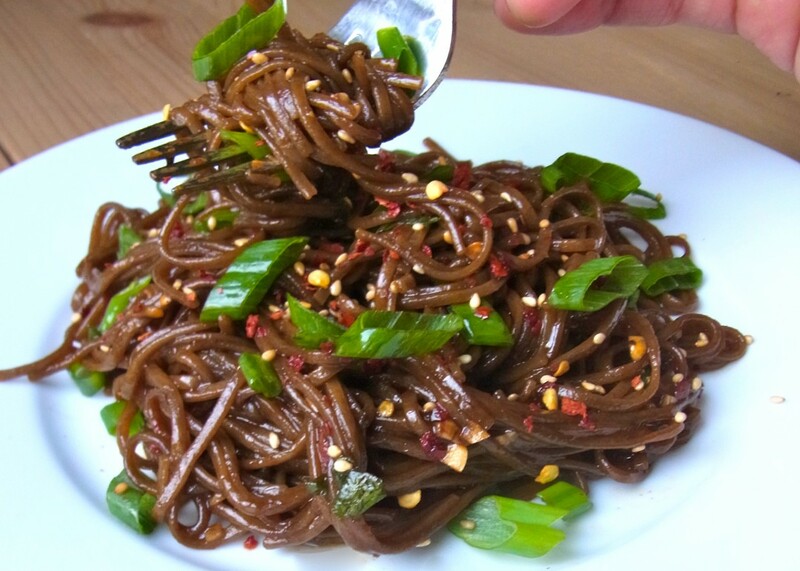 Soba noodles are not only good for you, they are easy to prepare, which makes them perfect for a quick lunch or snack. In the six minutes it takes you to cook these noodles, you will have plenty of time to make the dressing. For an even heartier meal, you can also add a little shredded chicken or a handful of snap peas to the mix. Individual serving sizes of soba noodles. Cook the soba noodles as directed in packaging instructions. Meanwhile, make the dressing for the noodles. To make the dressing combine the oils, soy sauce, vinegar, garlic and chili flakes in a medium-sized mixing bowl. Whisk together to combine ingredients. Once noodles have cooked, drain and pour them into the bowl of sauce. Combine the noodles and sauce soy until well incorporated and top with sesame seeds and scallions. Enjoy hot.